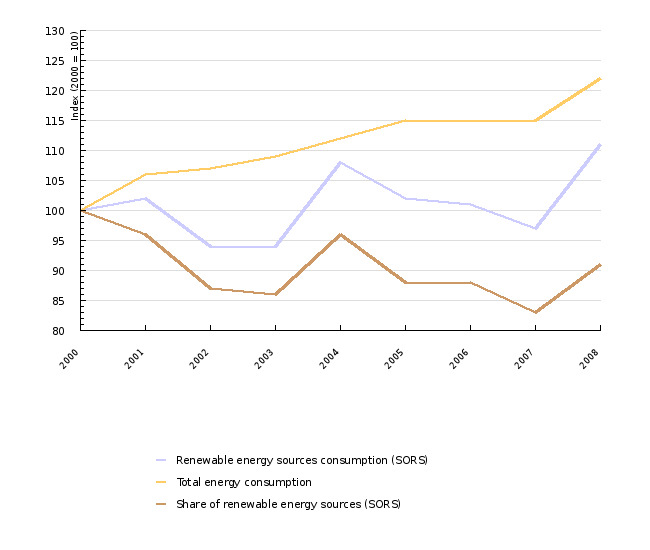 The share of renewable sources in total energy consumption increased in 2008; however, the set objectives are still far away. The most important renewable energy source is wood biomass, followed by hydropower. Jožef Stefan Institute, 2009; Statistical Office of the RS, 2009; Ministry of the Environment and Spatial Planning, 2009. * Solar energy, geothermal energy and liquid biofuels are not included in the increase of total energy consumption from RES, as there is no data for 2000. - 10 % share of biofuels in motor vehicle fuels for 2020. Consumption from renewable energy sources has a smaller impact on the environment than the use of fossil fuels or nuclear energy. Therefore, the monitoring of the share of renewable energy sources provides an indication for the trend of total energy consumption – environmentally friendly or not. However, we still have to be aware that there is an impact from renewable energy sources, which depends on the source itself. Namely, the construction of hydroelectric and wind power plants requires a big intervention in space, influences ecosystems and hydrology; furthermore, waste incineration plants are problematic with regard to emissions, while the production of biofuels can be problematic due to the use of pesticides, etc. Therefore, attention should be paid, in the planning process of the use of renewable energy sources, to reducing the negative impact to the minimum level. 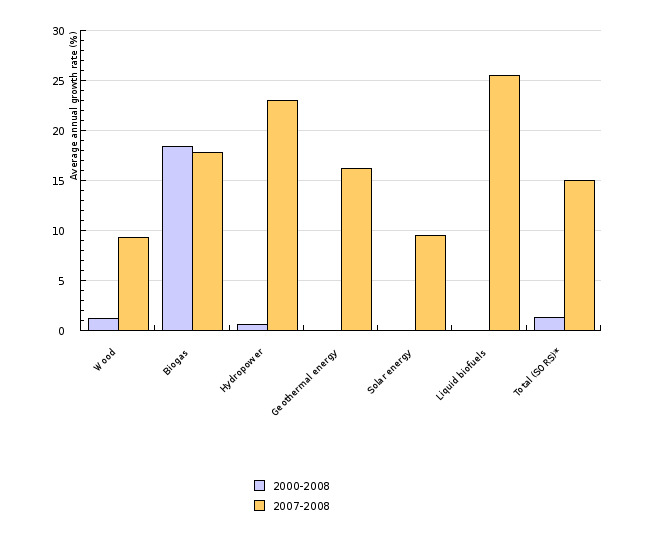 Consumption from renewable energy sources in 2008 represented 10.9 % of the total energy consumption, which is 0.9 percentage points more than in 2007. At the same time, this is 1.1 percentage points less than the objective for 2010 set in the Resolution on the National Energy Programme. The statistics on consumption from renewable energy sources before 2000 are based on a different (lower) assessment of the use of wood biomass; therefore, the data for the periods 1992-1999 and after 2000 are not mutually comparable. The low share is, besides the record consumption from RES, a result of the record total energy consumption. The consumption from RES was in 2008, with regard to 2000, higher by 11 %; the total energy consumption was higher by 22 %. In 2000, the share of RES was equal to the target share. The consumption from RES in 2008 amounted to 845 ktoe, which is 15 % more than the previous year. In the period 2000-2008, the consumption fluctuated a lot, which is primarily a consequence of fluctuations in electricity production in hydroelectric power plants. The most important sources are wood biomass and hydropower. Wood and other solid biomass represented, with 56 % in 2008, the most important renewable energy source in Slovenia, which is, with regard to the high coverage of Slovenia with forests in 2008, 58.5 % (Slovenian Forest Service, 2009), expected. Biomass includes wood and wood waste, bone flour and fats as well as paper sludge. The majority of wood biomass is used in households (in 2008, 69 %), followed by industry with 16 %. The use of wood biomass in electricity and heat production increased in 2008 by almost 100 %, which is a result of the start-up of the co-incineration plant in Šoštanj thermal power plant (January), Trbovlje thermal power plant and Ljubljana thermal power and heating plant (November). Besides the larger units that represent the majority, wood biomass is used in conversion also in CHP plants in industry and in heating plants. The data on the use of wood biomass in households have remained unchanged since 2002, when the last survey on energy consumption in households was carried out. Due to high prices of heating oil in recent years as well as the promotion of investments, the number of households using wood biomass for fuel has definitely increased. On the other hand, due to the installation of new boilers and higher energy efficiency in buildings, the efficiency of the use of wood biomass has increased as well. In industry, the use of wood biomass has been decreasing since 2005 after years of growth. The main reason is the closure of the cellulose production in the Vipap company. In 2008, the use was 8 % lower than in 2000. 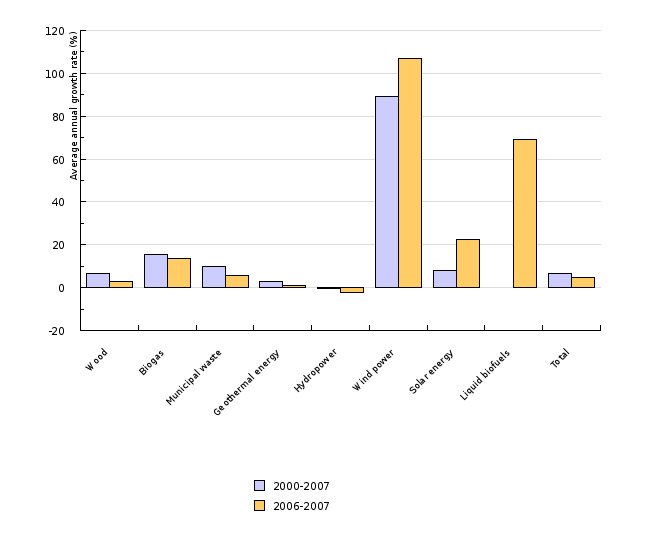 The total use of wood biomass in 2008, with 469 ktoe, was 10 % higher than in 2000. The monitoring of the use of wood biomass is problematic especially in households, since larger amounts of wood are sold in the grey economy or used by the owners of forests (73 % of forests are in private ownership (Slovenian Forest Service, 2008)). The use of wood biomass is with regard to CO2 emissions a renewable energy source, since it is considered as a CO2 neutral fuel. For the emissions of other substances, wood biomass is not an environmentally neutral fuel. The use of wood biomass is especially problematic when used in older boilers with bad incineration conditions, where larger amounts of volatile organic compounds are released, beside particles, which generate ground-level ozone. New boilers run on wood biomass have significantly lower emissions of the indicated compounds. The use of wood biomass will continue to increase in the future, since it represents a domestic energy source that does not contribute to CO2 emissions; furthermore, Slovenia is bound to increase its share of RES. However, this source must be used rationally, since is it also used for other purposes – construction, the furniture industry, etc. The purchase of new modern boilers run on wood biomass is encouraged by the Efficiency Use and Renewable Energy Sources Division at the Ministry of the Environment and Spatial Planning and the Ecological Fund of the Republic of Slovenia. In the process of being adopted is also the Operational programme of energy utilisation of wood biomass for the period 2007-2013, the purpose of which is to increase the energy utilisation of wood biomass. The programme shall define the main barriers for the higher consumption of wood biomass and contains the main mechanisms for the elimination of barriers and attainment of objectives. The implementation of the programme shall contribute to the increase of the use of wood biomass by 3.4 PJ. Wood biomass is at this moment primarily used for heat production. The second most important renewable energy source in Slovenia is hydropower. Electricity production from hydropower is due to the higher water stage of rivers in 2008 which were 23 % higher than in 2007, and 5 % higher than in 2000. The production capacities in the period 2000-2008 increased by 19 % on account of the restoration of bigger hydroelectric power plants and the construction of the Boštanj hydroelectric power plant, as well as the construction and restoration of smaller hydroelectric power plants. In 2002, the construction of the chain of hydroelectric power plants on the lower Sava commenced. The chain of five hydroelectric power plants is planned to be completed by 2018. The total electricity production shall amount to 720 GWh. In preparation are also other projects for the use of water potential: hydroelectric power plants on the mid-Sava and Mura, etc. Other renewable sources used in Slovenia include: landfill gas, gas from purification facilities and other biogases (biogas facilities in agriculture) that belong to biogases, geothermal energy, solar energy and biofuels. 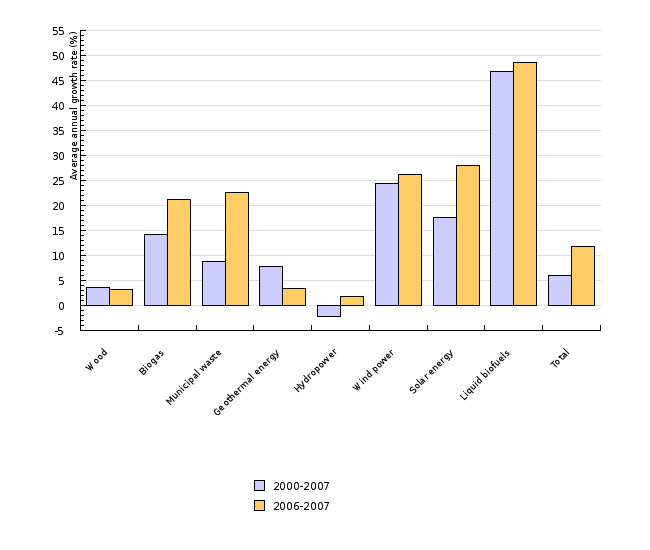 The use of biogas in the period 2000-2008 increased by 288 % especially on account of the recovery of landfill gas and its energy utilisation (as required in the Decree on the landfill of waste and the former Rules on the landfill of waste) and the exceptional increase of the use of biogas in agriculture, which increased in 2007 by almost 800 %. In 2008, the use of biogas increased by almost 18 %. In 2008, the growth of the use of liquid biofuels in transport continued. The data on the use of liquid biofuels are available from two sources. Besides SORS, these data are collected and published also by the Ministry of the Environment and Spatial Planning, which is in accordance with Directive 2003/30/EC on the promotion of the use of biofuels or other renewable fuels for transport, obliged to report to the European Commission. For 2008, the data of MESP were, by 8.3 ktoe or 51 %, higher. Therefore, big differences in the growth of the use of this fuel appear also in 2008. On the basis of the data of SORS, the growth was 26 %, while on the basis of the data of MESP it was 78 %. Following are the sources, which are not monitored by SORS; in the preparation of the indicator assessments, which were obtained within the framework of the EurObserv project that is implemented in Slovenia by the Centre for Energy Efficiency, Jožef Stefan Institute, were considered. The use of geothermal energy in 2008 was estimated at 20.8 ktoe, which represents more than 2 % of the total energy consumption from renewable energy sources in Slovenia. In recent years a high increase in the use of heat pumps can be observed; however, their statistical consideration is still not defined also at the EU level. Geothermal energy is used for heat production, largely in spas. 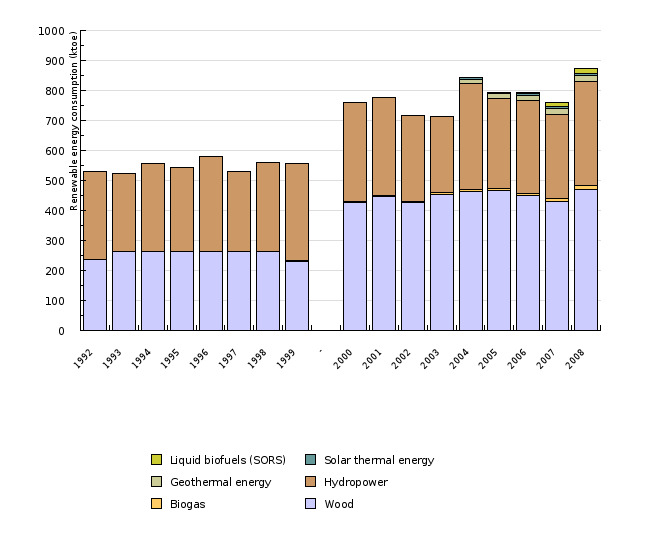 Solar energy is primarily used for the heating of sanitary water (assessment for 2008, 8.1 ktoe), while electricity production contributed 0.18 ktoe. Solar power stations have been increasing in recent years, which is primarily due to the change of fixed redemption prices of electricity from qualified producers. Higher consumption from renewable energy sources is promoted by various mechanisms. Investments in new equipment are promoted by the Efficiency Use and Renewable Energy Sources Division with subsidies and by the Ecological Fund of the Republic of Slovenia with favourable loans and subsidies. Higher consumption from renewable energy sources for electricity production is promoted through the system of fixed redemption prices for qualified producers, which was upgraded in 2009. The results are higher incentives for consumption from all RES, with the exception of solar power stations. The use of biofuels is promoted through the exemption of excise duties, while the distributors of liquid motor fuels must achieve objectives as stipulated in the Decree on the promotion of the use of biofuels and other renewable fuels for the propulsion of motor vehicles (OG RS, No. 103/07). In the EU-27, consumption from renewable energy sources in 2007 represented 7.8 % of the total energy consumption. With regard to 2000, it increased by almost 42 %. Consumption from renewable energy sources in the EU-27 varies in different countries, since it is dependent on natural resources. 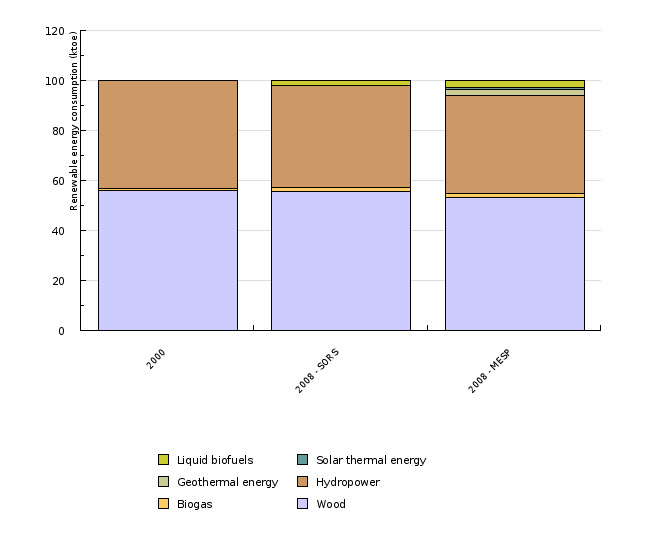 In the EU-27, the use of wood biomass prevails (49 %), followed by hydropower (19 %), municipal waste (10 %), biofuels (7 %), wind energy (6 %), geothermal energy (4 %), biogas (4 %) and solar energy (1 %).